Maintenance Program « Interstate Creative Design Corp.
A Professional cleaning with Protective Coating application. A Professional cleaning with Guard application & Buffing. Concrete is one of the strongest building materials available. 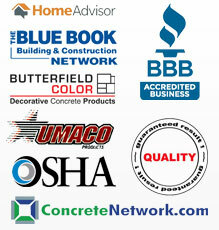 Stamped decorative concrete combines the strength of concrete with color and design to produce a beautiful surface. A Proper installation will ensure that the concrete will remain structurally sound for decades. Proper maintenance will ensure that the concrete surface remains beautiful for decades. Concrete should always be installed over a strong base. IDCD (Interstate Decorative Concrete Designs) installs concrete over at least 4 inches of compacted process gravel. The installations are reinforced with steel mesh as well as micro fiber mesh. At least 2 coats of sealer are used to preserve the surface. Maintenance is required when the outer layer of sealer has been compromised. Depending on the type and frequency of traffic, sealing may be required every 1-5 years. IDCD uses a sealer with 53% solids. Therefore, the sealer will form a barrier against water, petro-chemicals, and UV light. Unsealed concrete will absorb water. Water + Traffic + Time = Wear. As the top surface wears, the aggregates (stones inside of the concrete) begin to expose. This effect is most commonly seen on concrete city sidewalks and roads. Sealing the surface is a simple and inexpensive process that will solve this problem. Once the surface is sealed, it must remain sealed. Driveways, carports, and high traffic walkways should be sealed every year. These surfaces are used 12 months out of the year and are subjected to plows and/or shovels and/or snow blowers. Sand is the only material used to melt snow on the decorative surface. Rock salt and dry ice should not be used. These melting materials will accelerate the wear on the sealer and can potentially damage the concrete surface. Rear patios, pool decks, and rear walkways are surfaces that are generally not used in the wintertime. Therefore, they only receive 5 to 7 months of abuse. These can be sealed every 2-5 years. IDCD recommends that all surfaces be sealed yearly. Oils, grease, WD40, and other petroleum based chemicals will affect the surface of decorative concrete. It will penetrate the sealer and stain the concrete if allowed to stand on the surface for a long period of time (2+ hours). If a petro-chemical is spilled on the surface, wipe it clean and the surface will be fine. UV Light affects the pigments within the concrete. Colors will fade if the surface is not sealed and is exposed to the sun. Maintaining a sealed surface will preserve your color. Chemicals such as xylene, lacquer thinner, and paint thinner are detrimental to the sealer. These chemicals will absorb into the sealer very quickly and may alter the appearance of the decorative concrete. If a thinner is spilled, do not wipe it off. Allow the thinner to evaporate off the surface. Exterior concrete are subject to freeze/thaw cycles. Expansion joints are cuts that are made to allow for the expansion and contraction of the concrete slab. The 4 inches of process gravel is responsible for reducing the pressure of frost heaves. Cracks may appear over time if pressure on the concrete slab is not diverted into the expansion cuts. Cracks can appear for no reason at all. Even if all steps in a proper installation are followed, cracks may still appear. The solution is to fill the crack and hide it by using color. That area of the installation should then be monitored yearly. Cracks are never repaired, they can only be filled. Once filled, a crack can resurface over time. The time frame can be from 1 year to 10 years. It is dependant on the Earth’s movements. In IDCD’s experience, this has occurred in less than 5% of installations. In all cases the cracks were hairline and easily hidden at no cost to the client.